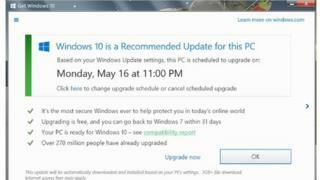 Microsoft has u-turned over changes it made to a pop-up encouraging users to upgrade to Windows 10. Users were angry that clicking the cross to dismiss the box meant that they had agreed to the upgrade. Based on "customer feedback", Microsoft said that it had added another notification that provided customers with "an additional opportunity for cancelling the upgrade". The pop-up design had been described as a "nasty trick". Microsoft told the BBC it had modified the pop-up two weeks ago as a result of criticism: "We've added another notification that confirms the time of the scheduled upgrade and provides the customer an additional opportunity for cancelling or rescheduling the upgrade. "If the customer wishes to continue with their upgrade at the designated time, they can click 'OK' or close the notifications with no further action needed." Senior editor at PC World magazine Brad Chacos, who describes himself as a fan of the Windows 10 operating system, had previously described the use of the cross to mean people had agreed to the upgrade as "a nasty trick". He said: "I don't think that adding more pestering pop-ups improves the situation. At the very least they should add a large, obvious 'No, I don't want this' button." Mr Chacos has been a vocal critic of what he described as the "heavy-handed tactics that Microsoft's been using to force people into the upgrade". Previously, users had to press the cross to cancel the suggested upgrade, he pointed out, so the latest move is counter-intuitive - "akin to swapping out the brake and the accelerator in your car". Users have been sharing with the BBC their own experience of unwanted upgrades, suggesting that the process is difficult to cancel once it has begun. Havard Hughes' experience was typical of many. "Windows 10 update ran on my PC despite all my efforts to stop it, including dismissing the update several times and frantically trying to abort the installation as it started when I was halfway through writing an important e-mail. "My attempt to roll it back to Windows 7 resulted in the blue screen of death and a dead PC. I now have to reinstall my home computer from scratch because of this so-called 'free' upgrade. "As someone who paid for my software and was perfectly happy with my fully functional Windows 7 machine, this has been an absolute disaster."